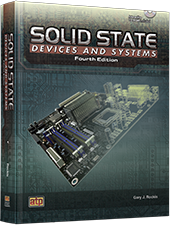 Solid State Devices and Systems, 4th Edition, presents a comprehensive overview of solid state devices and circuitry. This new edition is designed for electricians, students, and technicians who have a basic understanding of electricity. Component and circuit construction, operation, installation, and troubleshooting are emphasized and supported by detailed illustrations. Various practical applications are presented throughout the book as they relate to temperature, light, speed, and pressure control. Electron current flow is used throughout the book. Electron current flow is based on electron flow from negative to positive.